I went along to the Abbotsford Suppermarket the other night with my wife and daughter. 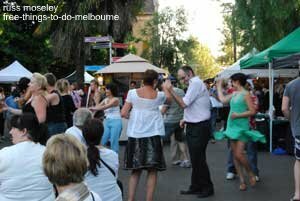 It's one of a few night markets Melbourne has. The actual market area is a bit small with a limited number of stalls. At first I was disappointed although what was there was quite good quality. But the place soon livened up with a really good live band playing and with lots of the locals dancing. .......there are loads and loads of food stalls.......light-bulb moment! ......We obviously spent too long enjoying listening to the salsa band and watching the dancers. It's definitely a good place to spend a few hours on a Friday night. Bring a rug to sit on and a few friends. My main advice is to take along your own picnic - the queues at most of the food stalls were enormous. ..........There's also free face painting for the kids and a playground area for them. 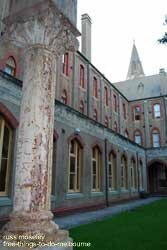 The grounds are great for walking around and the old Abbotsford convent is an interesting historic building to have a look at too. Unfortunately the Suppermarket is only on in the summer though. Check out the website at Abbotsford Suppermarket for dates. It's open 6pm-10pm Friday nights. 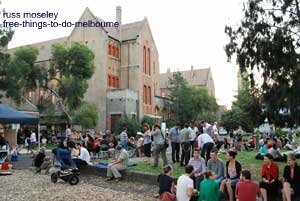 Address is 1 St Heliers Street, Melbourne. If you drive here, avoid the car park which charges $4. Park in a nearby street..... You'll find loads of two hour free parking spaces available within 200-300 metres. Check out the map below to find it.